If you are looking for information on the Bonus Building Care franchise business opportunity, Bonus Commercial Building Care franchises or Bonus Building Care franchising, then you have come to the right place. The commercial building care industry is a major component of the burgeoning cleaning service sector of the economy. As a Bonus Building Care franchise owner you can position yourself to take advantage of the opportunities this expanding market has to offer. The commercial cleaning industry is exploding with growth. Why not be a part of it? According to the U.S. Department of Labor, Bureau of Labor Statistics, "janitors and cleaners" will be one of the top two growing areas of employment for the next decade. Who will employ these janitors? It could be you! After the owners of a building turn on the power and arrange for security, janitorial service is the next item on their agenda. A building cannot seek tenants until the power, water, security and janitorial services have been obtained. In addition, janitorial services are also a part of many tenant leases. The commercial cleaning segment of the cleaning industry is more predictable and constant than carpet cleaning businesses, maid services and other specialty cleaning businesses. The fact that you are aware of the total amount of your contract's total at the end of each and every month, allows you to project your future months' gross billings with some degree of certainty. The cleaning industry's size and stability combined with the outstanding business programs at Bonus Building Care result in an opportunity unmatched in the entrepreneurial marketplace today. Each industry has strengths and weaknesses and we feel that the continuing stability of the cleaning industry makes it an obvious choice for success. 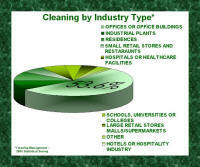 The Commercial Cleaning Industry offers a variety of service opportunities as evidenced by the graph to the above left depicting the types of business most often cleaned. 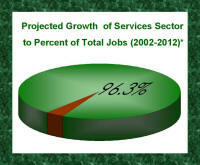 Additionally, according to the U.S. Department of Labor, Bureau of Labor Statistics, service-providing industries are expected to account for approximately 20.8 million of the 21.6 million new wage and salary jobs generated over the 2002-12 period, this represents 96.3% of new jobs as exhibited by the graph to the above right. Making correct decisions on future investments depends heavily on a study of tomorrow's leading industries. According to the chart above (source - U.S. Department of Labor, Bureau of Labor Statistics), the janitorial field will be among the leading occupations having the largest numerical increase in employment from the years 2002 to 2012.